How does Fox feel about Fringe’s performance on Friday so far? Quite enthusiastic. Now, this interview was just before last Friday’s second-in-row dip, but most other shows also fell that night and one rating does not a reputation make. As for Human Target …. Translation: We’re going to decide about Human Target and Lie after we see our pilots for next fall. But keep in mind, Fox only programs two hours a night, so that’s a pretty crowded shelf…. 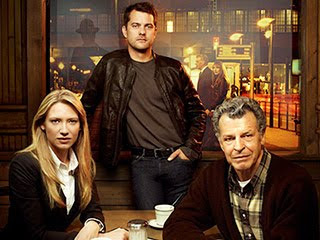 I love Fringe,it's the Best show out there right now.You cancel it you'll loose alot of fans for Fox! The best sci-fi show to come down the pike in many a year; and I'm very hard to please!